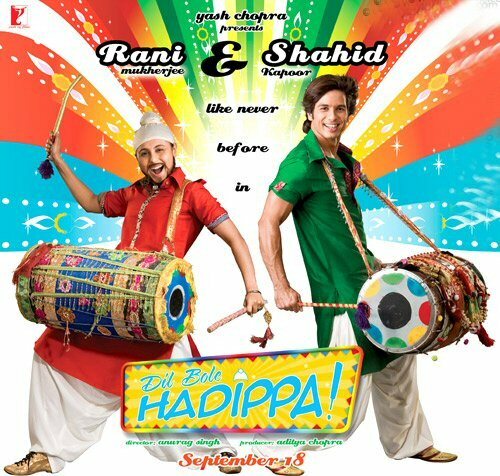 Toronto, July 31 (IANS) Yash Raj Films' "Dil Bole Hadippa" and Ashutosh Gowariker's "Whats Your Rashee?" will have their world premiere at the Toronto International Film Festival (TIFF) here in September, organisers have announced. The world's biggest audience-based film festival runs Sep 10-19. Set for release Sep 18 in India, "Dil Bole Hadippa" is directed by Anurag Singh. It is a hilarious drama-comedy with Shahid Kapoor (Rohan) and Rani Mukherjee (Veera Kaur) in lead roles. It also features Anupam Kher, Dalip Tahil, Rakhee Sawant and Sherlyn Chopra. The highlights of the film include Veera Kaur putting on a turban and beard and becoming Veer Pratap Singh to play cricket in a village where girls are forbidden from playing the sport. Her performance earns her a place in Rohan's team, kicking off their roller-coaster journey filled with music, romance and comedy through Punjab and beyond, said a statement by the organisers here. "What's Your Rashee? ", directed by Ashutosh Gowariker, is another Indian film making its international premiere at the festival. Based on the Gujarati novel "Kimball Ravenswood" by Madhu Arya, this romantic comedy stars Priyanka Chopra and her former beau Harman Baweja. Its storyline revolves around a young man who has always wanted to marry for love. When he is suddenly told that he must find his dream girl within 10 days to save his family from ruin, he discovers that finding her in a hurry is tough. Deepa Mehta's "Heaven on Earth" had its world premiere at the festival last year. Anees Bazmee's hit "Singh is Kinng" and Nandita Das's directorial debut "Firaaq" also had their gala premiere last year. Called a people's festival as opposed to industry-based Cannes, the Toronto festival generates revenue by selling over 300,000 tickets each year. Last year, more than 300 films from 64 countries were screened at the festival which has become a major global film festival since its beginning in 1976.